Way back in November 2014, it was revealed that composer Hans Zimmer is teaming with Junkie XL (a.k.a. Tom Holkenberg) to work on the score for Warner Bros.' Batman v Superman: Dawn of Justice. 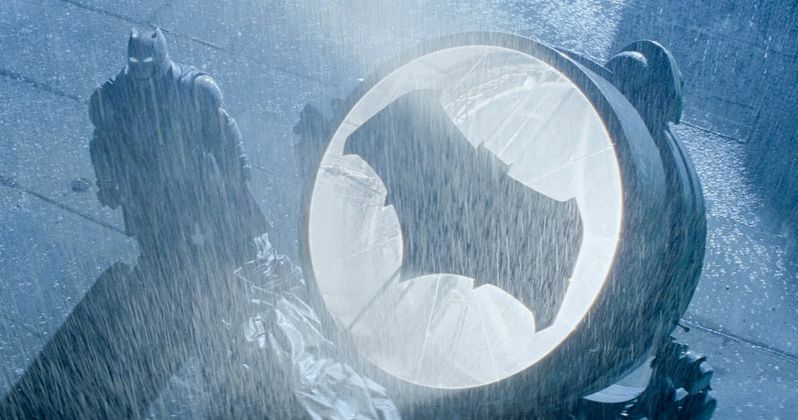 Hans Zimmer will craft the theme for Superman (Henry Cavill), like he did in 2013's Man of Steel, with Junkie XL working on a new Batman (Ben Affleck) theme. Earlier today, Water Tower Music released the Batman theme, entitled "Men Are Still Good (The Batman Suite), which you can listen to below. Before taking on the job, Hans Zimmer admitted in September 2013 that he was unsure about taking on this job, because he didn't want to create new Batman music after working on Christopher Nolan's The Dark Knight trilogy. Junkie XL, a.k.a. Tom Holkenborg, most recently composed scores for Mad Max: Fury Road, Black Mass and Point Break, along with the upcoming Deadpool. His other credits include Divergent, 300: Rise of an Empire and Paranoia, and he also provided additional music for both Man of Steel and The Dark Knight Rises. Last month, Warner Bros. and Water Tower Music released the full track list for the Batman v Superman: Dawn of Justice soundtrack, which will be released on March 18, one week before the movie arrives on March 25. The 2-CD deluxe package, the digital deluxe version, and the 3-disc deluxe vinyl set feature over 90 minutes of music, five bonus tracks, an exclusive fold-out poster and liner notes from the composers. Additionally, the vinyl set features etched vinyl art and an album download card. From director Zack Snyder comes Batman v Superman: Dawn of Justice, starring Oscar winner Ben Affleck (Argo) as Batman/Bruce Wayne and Henry Cavill as Superman/Clark Kent in the characters' first big-screen pairing. The film also stars Oscar nominees Amy Adams (American Hustle) as Lois Lane, Jesse Eisenberg (The Social Network) as Lex Luthor, Diane Lane (Unfaithful) as Martha Kent, and Laurence Fishburne (What's Love Got to Do with It) as Perry White; Oscar winners Jeremy Irons (Reversal of Fortune) as Alfred, and Holly Hunter (The Piano) as Senator Finch; and Gal Gadot as Wonder Woman/Diana Prince. Zack Snyder directed from a screenplay written by Chris Terrio and David S. Goyer, based on characters from DC Comics, including Batman, created by Bob Kane with Bill Finger, and Superman, created by Jerry Siegel and Joe Shuster. The film is produced by Charles Roven and Deborah Snyder, with Wesley Coller, Geoff Johns and David S. Goyer serving as executive producers. Listen to the new Batman theme from Batman v Superman: Dawn of Justice, and stay tuned for more on this highly-anticipated superhero adventure.